Cryotherapy is the faster, more effective alternative to a traditional ice bath. One session is all it takes to trigger the body’s natural responses to begin healing itself. It’s benefits include a metabolism boost, less muscle soreness, improved sleep quality, endorphin boost, mood enhancement, improvement in athletic power and endurance, skin tightening, and collagen production. CryoSlimming uses cold temperatures to reduce fat. Customers usually lose over half an inch in the first 28-minute session. The treatment consists of a 3-phase thermal shock that will help naturally destroy fat cells. Whether you’re looking to lose fat on your stomach, thighs, arms or back this is the solution for you. With CryoToning Cellulite, there’s finally a real, non-invasive solution to help you to reduce stubborn cellulite. When diet and exercise aren’t enough, Cryoskin will help you to achieve the look you’ve been striving for. CryoToning Facial treatments reduce the appearance of fine lines and wrinkles whilst improving your skin. This cold therapy treatment will help improve your microcirculation and speed up your metabolism, which results in higher collagen production. Ultra cold air is strategically patterned along the scalp, face, and neck for this trademarked CryoFacial that stimulates collagen production and improves blood flow. Clients report benefits of the CryoFacial to include: reduced pore size, reduction in the appearance of wrinkles, and brightens dark spots. If you want tighter and more even toned skin, the CryoFacial is for you. Enjoy the benefits of a full body detoxification, stimulation, rejuvenation and skin purification. You can enjoy this alone or with a partner. Our Infrared Sauna reaches 158 degrees fahrenheit and heats the body directly compared to normal saunas which heat the air. Localized Cryotherapy is a targeted application used to reduce pain, inflammation, and swelling. It is an ice pack on steroids. We localize the treatment to draw blood away from the area so it becomes more oxygenated and nutritionally dense and speeding up the healing process as a result. NormaTec is your personal, on-call, massage therapist. The patented Sequential Pulse Technology helps you recover faster between workouts by reducing muscle soreness and improving circulation. Available for the arms, legs or hips. Variety of vitamin cocktails that will give you the “kick in the kaboose” that you need. We have vitamin B-12 shots, fat burner skinning shots, immune booster shots, weight loss shot that will give you the “kick in the kaboose” that you need! B12 and other natural energy boosters can make you feel ready to take on the world…one infusion at a time! Interested in hosting an office party? 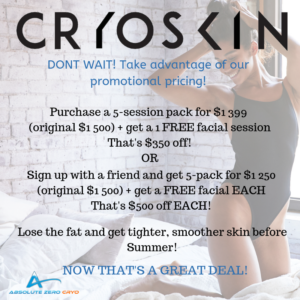 Subscribe for deals and latest Cryotherapy news! + get a 1 FREE facial session – That’s $350 off! + get a 1 FREE facial session EACH – That’s $500 off EACH! Live Cryoskin Slimming session at the event! Appetizers by Slater’s 50/50 & swag bags! Gift certificates by NexGen Fitness Preston Hollow ($500 value) – 2 winners. 1 FREE month at CYCLEBAR. 3 gift cards by Ozone Purity and many other prizes!